In this post I’ll try to answer that question in the context of using WP Update Server to serve plugin updates. I will also provide a couple of practical examples from one of my commercial plugins. Give some kind of security token to each user. This could be a login + password to a membership site, a license key, or something more esoteric. Whenever someone installs your plugin on their site, ask them to enter the key/log in/whatever. Modify the plugin to append the token to each update request. Write a server script that verifies the token before it allows download. How you implement the first two steps will vary greatly depending on your plugin UI and what online store, cart software, or membership plugin you use. You might already have some kind of customer authentication mechanism in place that just needs a bit of tweaking to be used for updates, or you might need to build your own from scratch. There’s no “one size fits all” solution here. Personally, I prefer to use license keys. Whenever someone buys my Admin Menu Editor Pro plugin, the order processing script generates a random key, stores it in the database, and sends the key and a download link to the customer’s email. 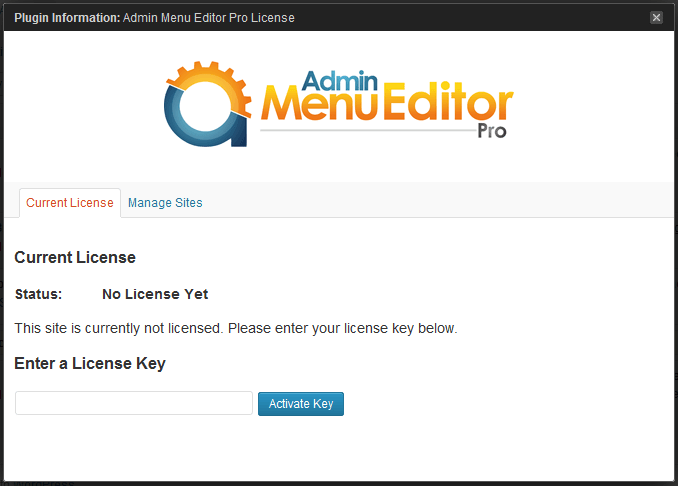 Then, when they install the plugin, there’s a link to enter the license key. Now, how do we add our security token to each update request? You can do that by using the addQueryArgFilter($callback) method of the update checker. The callback function will receive an associative array of query arguments. Just add the token to the list and return the modified array. //Add the license key to query arguments. Retrieve the query argument(s) that contains the token by using $request->param('arg_name'). Verify the token. Again, this part is up to you. You could look it up in a database, use a checksum to validate it, or something else. If the token is good, you don’t need to do anything special. If the token is invalid, call $this->exitWithError('Error message') to output an error and stop script execution. Below is a simplified version of the script I use to implement secure updates for Admin Menu Editor Pro. It is slightly more advanced than the above outline, but the general idea is the same. //Load the license, if any. //If the license doesn't exist, we'll output an invalid dummy license. //or two since the plugin doesn't need to explicitly fetch license details. //Only include the download URL if the license is valid. //Append the license key or to the download URL. //No license = no download link. //Prevent download if the user doesn't have a valid license. This entry was posted on Tuesday, March 19th, 2013 at 10:20	and is filed under Business, WordPress Development. You can follow any responses to this entry through the RSS 2.0 feed. You can leave a response, or trackback from your own site. I’ve been using your libraries for theme and plugin auto updates. Both of them are simple to implement and work great. I’m looking forward to implementing the WP Update Server. Hi, is there a tutorial how to do this? My PHP knowledge is not good enough to fix this. Or can you help me to fix this? I have no idea how to start. I use your Plugin Update Checker with the WP Update Server and that work awesome. I like the way you use with a license key, but thnx I try to figure it out. Would you happen to know of any way to post some parameters when WordPress goes to the download url for the zip? Just wanted to thank you for your great, better, best contributions to Github with the Plugin Update Checker and the Update Server. Thanks for the great update checker and the surrounding infrastructure. The only thing that was missing for us was a nice GUI to enter the download credentials. I put this extension under the MIT license, too. In my opinion, our code can be directly included in your plugin checker to provide a possible GUI component, too. If the user does not register any credentials, our extended class should behave just like your base update checker. @Matt: I’ve seen your GitHub issue, but unfortunately I’m a bit sick and don’t have the time for debugging. I’ll look into it when I can. hopefully this saves someone else the time it took me to figure out. Thanks for the report, I’ve fixed the code sample. Sorry, that’s something you might have to figure out yourself. Right now I don’t have the time to research and produce tutorials on how to integrate with third-party licensing systems. Never mind about banners. I added this to my filterMetadata function. Hi, thanks for you work, it’s great! … why the function wsh_filter_update_checks() is a class method? Anyway, it is not working at the moment. The ‘license_key’ is not passed as argument and I can’t see it in my MyCustomServer class. Do am I missing something? Any suggestion? Cthulhu generated this page with 51 queries, in 0.964 seconds.